Just recently we have redesigned one of our old favorites,…. 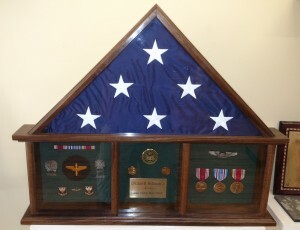 The Traditional Shadow Box. Still with the three bays measuring approximately 7″ x 8″ on the end compartments and the center measuring approximately 6″ x 8″ (inside dimension). We have added to the overall width to 26″, increased the inside dimensions to allow more room for your awards, and added a decorative opposing Ogee edge to the bottom and top and an Ogee edge to the flag compartment as well giving way to a more decorative traditional design.